Our Ship's Apprentice Program is a special opportunity for teenagers between the ages of 15 and 17 who have previously sailed aboard Adventuress on an overnight program. As a Ship's Apprentice, you will become a junior member of the crew, assist in leading a watch, improve your deck skills, and support our environmental programs. 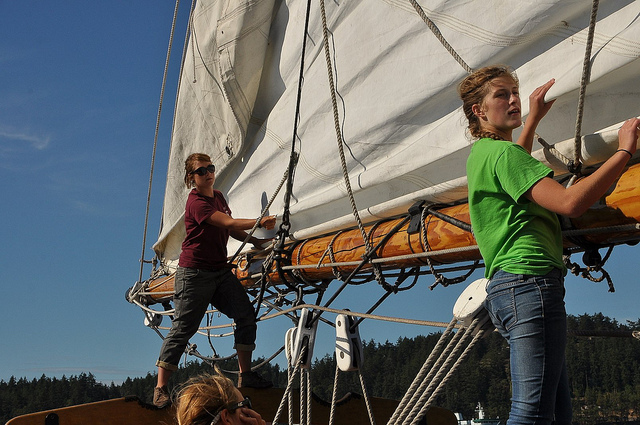 Ship's Apprentices join us for summer overnight trips that last anywhere from 3 to 6 days. The cost is $60 per day. A limited number of scholarships (full and partial) are available for teenagers whose families are unable to afford the cost of an Apprenticeship. The application process will open in early January of 2019. Applications will be accepted through March 31st for placement on a program in summer of 2019. Please note that space is very limited. We run around 8 overnight programs each summer, with space for only one Apprentice per program. First-time Apprentices will be placed on adult or intergenerational trips; returning Apprentices will be considered for placement on teen, intergenerational, and adult programs. Click here to download the 2019 apprentice application. Please e-mail or fax it to Susan at the information below.